We’d love your help. Let us know what’s wrong with this preview of Detour Before Midnight by Bernice Sims. June 21, 2014, marks the fiftieth anniversary of the infamous Neshoba County murders of civil rights workers James Chaney, Michael Schwerner, and Andrew Goodman. And, while it is good to remember and honor the victims of such devastating tragedies, it is also painful-particularly for those personally connected. 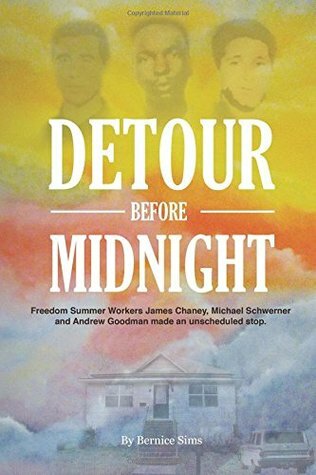 Detour Before Midnight is a unique historical memoir that casts June 21, 2014, marks the fiftieth anniversary of the infamous Neshoba County murders of civil rights workers James Chaney, Michael Schwerner, and Andrew Goodman. Detour Before Midnight is a unique historical memoir that casts you right in the heart of Mississippi during the Freedom Summer of 1964, rendering the civil rights movement through the passionate eyes of a young African American girl. Bernice Sims was just a teenager in the early 1960s, but she was already a member of the NAACP. She was also one of the last people ever to see Chaney, Schwerner, and Goodman alive. The three men made an unscheduled stop at her family's house on their way to investigate the charred remains of a voter registration site. Bernice begged them to take her with them on what would end up being their last mission. They refused. To ask other readers questions about Detour Before Midnight, please sign up.